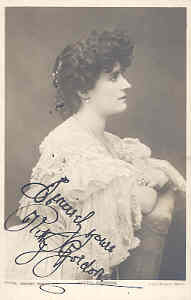 The actress Kitty Gordon was born as Constance Minnie Blades in Folkestone, Kent. She made her stage debut in 1901 at the Prince's Theatre in Bristol with "San Toy". It followed engagements at other theaters where she appeared in both classic plays as well as musicals. She got married with the theater manager Michael Levenston in 1903 but her husband already died four months later. In 1904 she got remarried with Henry William Walter Beresford who became a well-known support actor in Hollywood in the 30's. Kitty Gordon experienced other huge successes in the next years on British stages and when she moved to USA she was able to continue her career there successfully. She made her film debut in 1916 with "As In a Looking Glass", it followed silent movies like "Her Maternal Right" (16), "Vera, the Medium" (17), "Her Hour" (17), "Diamonds and Pearls" (17), "The Purple Lily" (18), "Adele" (19), "The Scar" (19) and "Playthings of Passion" (19). Afther this brief but intensive time in the film business she turned to the theater again where she kept busy till to the 50's. Kitty Gordon was married four times, her daughter Vera Beresford became also an actress.